The sound is sweet! No, not the typical American kind of sweet. For me it translates to beautiful. This is the kind of sound that leaves a sweet taste in your mouth. In this case you will hear a beautifully shaped Auditorium with a well-balanced sound, which Richwood managed to make surprisingly unique. I’m only familiar with the more expensive mahogany guitars made by Taylor, Collings and Martin, so forgive me if you know more than I do. But this Richwood produces a sound, that I haven’t heard coming from the more expensive models. The heating was turned up high and even though sweat was pouring down my forehead, I couldn’t put down the instrument. That is all you need to know! Go to a Richwood dealer and make your own judgement. This is the kind of sound that’ll make you smile! Right out of the box, the first things that catch my eye are the clean lines of mahogany on this Master Series model. Laminated, it’s relatively easy to equal the whole because the top consists of two parts, which run parallel very neatly. This model shows more examples of skilled craftsmanship. They used solid mahogany parts to strengthen the back. More expensive instruments sometimes even show an extra line near the bindings or the rosette, but I checked the whole body… No such thing! The nut could have been flattened a little more, as well as the bridge saddle. Both are made out of cow bone. Looking around in different music stores it becomes clear that Triple O’s or Auditoriums have become more dominant over Dreadnoughts and Jumbos. This body shape feels more comfortable on your lap because of its curve that rests perfectly on the thigh-bone. In fact, this little acoustic miracle plays well in all positions. It has two strap locks. The neck has a medium-sized C-shape. It feels comfortable and has a long sustain, also because of the nut and bridge saddle. A skilled guitar player, who tried out this model, had to use his palms regularly to mute. Even around the 16th fret a note has exactly the required sustain on all strings. The cotton-covered bracings provide body to the sound. The mahogany binding, instead of a spruce binding on the back probably contributes as well. It sounds tight and to my surprise unique. In my experience mahogany guitars usually sound warm and woolly, sometimes at the expense of sparkling highs and, more importantly, the distinction of notes when playing fast. With the A-50, this is not the case. The highs shine, mids have a bite which can be distorted a little when strumming hard and it has sufficient basses to complement the whole. This could mean that fingerpickers may be a little less interested since basslines are crucial for fingerpicking. I would suggest you give it a chance though, because it might surprise you. Amplified, the Fishman does its job. There is no EQ to manipulate the sound, so I would recommend using a P.A. system or an amp for acoustic instruments. I tried it out and recorded it with my computer. With a little EQ, a little more highs and lows and cutting some mids, you will find a beautiful formula for recording. This guitar comes in a beautiful, preprocessed…. Box. You may want to throw in some extra money for a cover. Given Richwood’s unique position (durable, wayward, affordable, solid construction) I hope that the Chinese or the people at Bas van den Broek BV will enclose a brochure with some background information (vision, production information etc). You may want to hold onto this instrument for the rest of your life and therefore its history may be interesting to you. To my experience mahogany provides a lot of warmth, but it also makes it sound a little woolly which blocks some of the highs. Richwood succeeds in removing this woolliness with their cotton-covered bracings. The highs have a special shine to them, which I have never heard before from a mahogany guitar. Richwood was founded in 1979 in China to produce accessories for musical instruments. 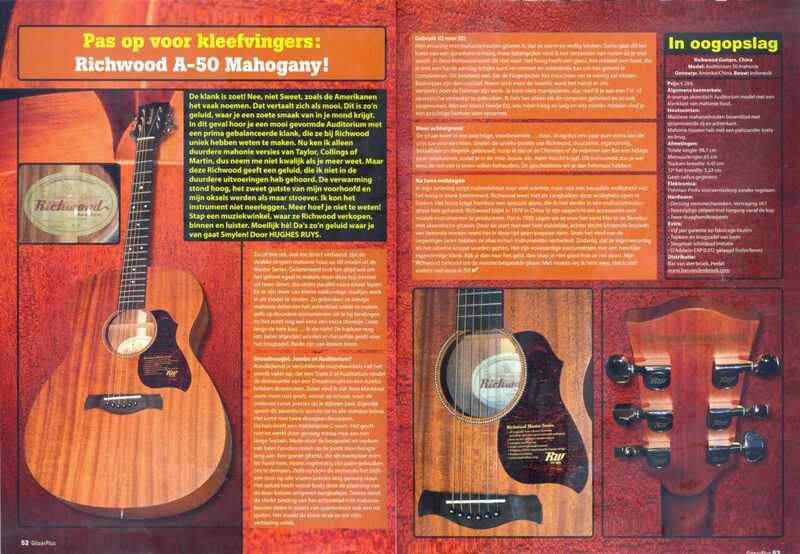 It wasn’t until 1992 that we started seeing Richwood acoustic guitars in the Benelux. Richwood started out producing bad quality copies of well-known brands, which didn’t make Richwood very popular. Since the late nineties they improved every aspect of their guitars, which made Richwood the ultimate bargain it still is today. They are complete and worthy instruments with a distinguished , quirky sound. Considering its price it’s hard to imagine how they do it. My other Richwood is one of my most played guitars. I’m having a hard time putting down the A-50 as well. source: Gitaar Plus Magazine (www.gitaarplus.eu).